Facilitating social interaction for children with Autism Spectrum Disorder (ASD) is crucial to help them communicate and connect with the society. In schools, adults should encourage kids with autism to mingle with typically developed peers on the play ground. Luckily, all children enjoy recess and playtime, because it is simply a time to have fun! Playtime is precious to teach social rules and develop civil behaviors. Why in schools? Because this is a place where large crowds of kids gather! During recess and lunch personnel are not always available! Volunteers are busy covering other activities of higher population. Why don’t we teach typically developed kids to socialize with their peers with autism? Both parents and educators should mentor their kids and coach them to approach kids with special needs. They will feel good about themselves taking on this mission. 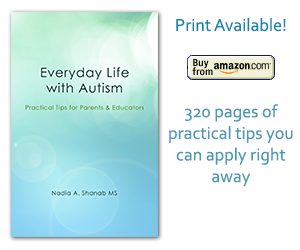 Most importantly, it is a fact of life that the number of individuals diagnosed with autism is on the rise. They are part of our community and society. We are all better off including them in our life and learn how to encourage them and welcome them to connect with us. Knowing that it is not easy, it is even stressful sometimes, for them to make the first step, go the extra mile and discover the great values in kids with autism. You can make a friend for life! In a study at the Vanderbilt University, it was found that peer solicitation-a child inviting another to play- can improve reciprocal social interaction among children with autism. Read here. Make it a habit, parents and teachers, to remind your child(ren) to take the initiative to socialize with peers with autism. It can change her/his life. It is so sad to see them isolated and lonely, when other kids are having fun playing and socializing with each other.